With the golden hour just about to begin it’s spectacular show, I couldn’t help but turn a few degrees to the East away from the obvious choice of the spectacular sunset out to sea. Down at beach level the sand patterns and tide pools were looking resplendent with the rocks, mussels and limpets adding fantastic supporting roles to a magnificent composition. 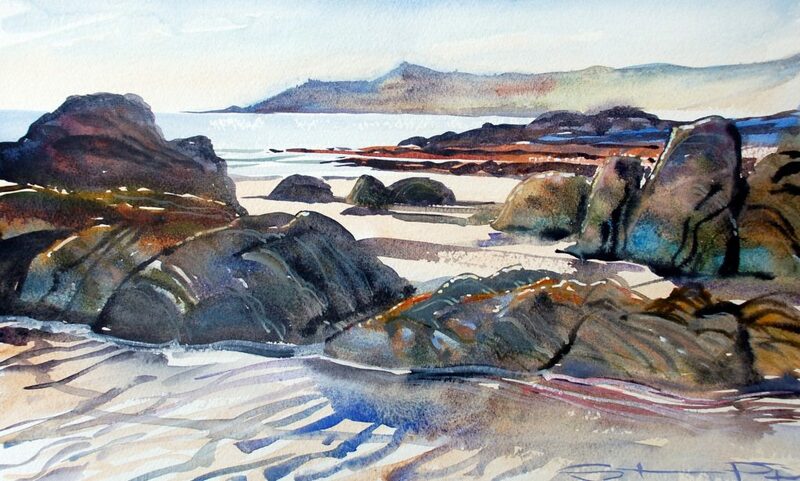 With the heat of the day waning fast, the painting stayed incredibly damp , which in turn allowed for some really interesting mingles in the subtle colour shifts of the beach and rocks. Unframed. Printed on 300gsm 100% Cotton Paper. Free Shipping. Prints will ship flat packed or rolled in a tube within 3 working days. (17 x 10 inches image size) ( 21 x 14 inches paper size).